Nissan will continue building the Skyline GT-R in the 21st Century, providing the ultimate driving pleasure to even more people worldwide. 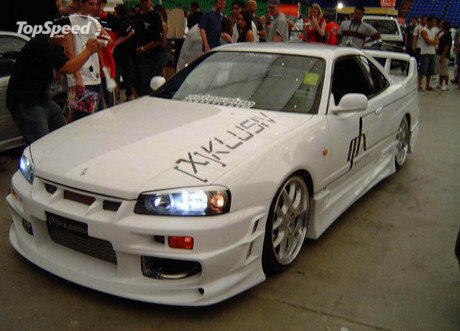 In its next generation Nissan is looking to introducing the Skyline GT-R in other markets worldwide. Successive generations of the GT-R have consistently pursued the ultimate in driving pleasure. Over the years, the GT-R has continued to be a supreme-performance road-going car that delivers superb driving pleasure by responding faithfully to the driver’s demands. Just sitting in the driver’s seat of the GT-R produces a feeling of excitement that envelops the entire body. Achieving the ultimate in driving pleasure means that the car must perform exactly as the driver expects. Meeting this expectation requires a faithful response to the driving actions executed by the driver, and the car must convey accurate information to the driver. In other words, the driver has to be able to judge the vehicle’s state accurately and instantaneously. Then, through the car’s consistently response to the accelerator pedal, steering wheel and brake pedal, the driver enjoys the pleasure of controlling the car at will. There is feeling of solid trust and oneness that forms between the driver and the car in this process, confidently bringing out both the driver’s skill and the car’s maximum potential. If drivers are to enjoy the ultimate in driving pleasure, the car’s potential must be raised to the utmost limits. Successive generations of the Nissan GT-R have truly incorporated superior specifications even among vehicles in this segment. With its unrivaled power, the engine has delivered outstanding acceleration and top speed combined with a driving sensation. A superior braking system has provided powerful braking performance, and an outstanding suspension has enabled the GT-R to corner with remarkable quickness. The GT-R has been the showcase for the highest levels of acceleration, cornering and stopping capabilities. The delicate balance between the powerful engine and responsive suspension has been pushed as each system surpassed last generation technology. As a result of that never-ending process, the GT-R has continued to embody the most advanced technologies available in every era. Successive generations of the GT-R have already established an unshakable position in Japan as a result of incorporating the highest levels of technology available in pursuit of ultimate driving pleasure. That superior performance transcended the oceans to make the GT-R the focus of envious looks the world over. Nissan is developing a new generation of GT-R for the 21st Century with the aim of placing it in the spotlight of the global stage, beyond the borders of the Japanese market.